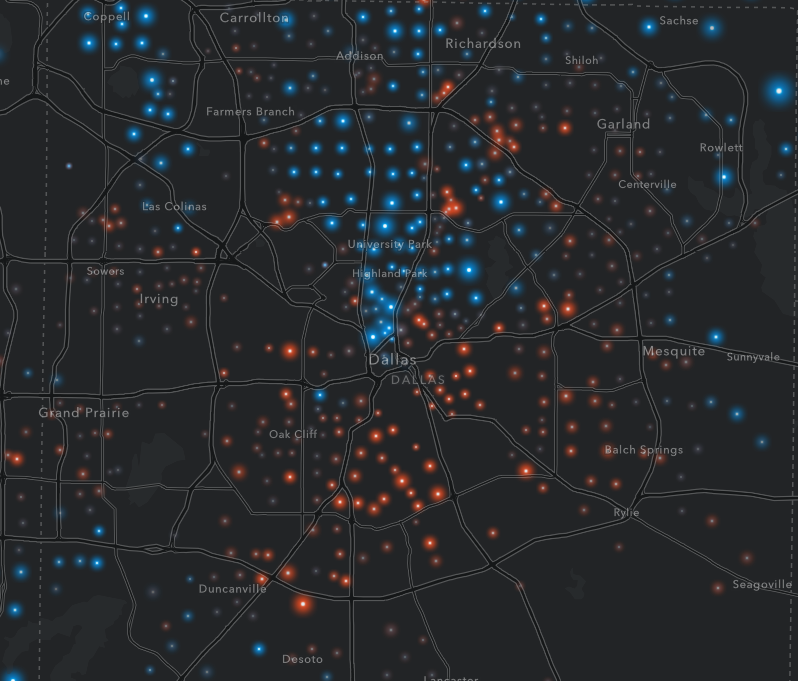 Economic inequality in North Texas is drawn along very clear lines. These aren’t the first maps illustrating the economic inequality in American cities, but they might be the prettiest. Put together by the mapping software company ESRI, here brightly colored dots pinpoint income disparities. There are three layers we can look at. The first is broken down by the predominance of households in a certain income bracket sharing a census tract. An orange dot shows where the predominant household income is less than $25,000. A pink dot, between $25,000 and $50,000. Purple, between $50,000 and $100,000. The light blue dots are where the rich folks live, counting census tracts where the predominant household income is more than $100,000. The bigger the dot, the more homes there are. The brighter, the more predominant one income bracket. Next, the concentration of wealth and poverty, stacking the proportion of top and bottom-income households in a census tract against the national average. About 22 percent of American households earn less than $25,000 a year, while a little less than 25 percent earn more than $100,000. Orange dots are where the lowest-income households exceed the national average, blue dots the highest-income homes. How far they diverge from the average can be measured by the brightness of each dot. 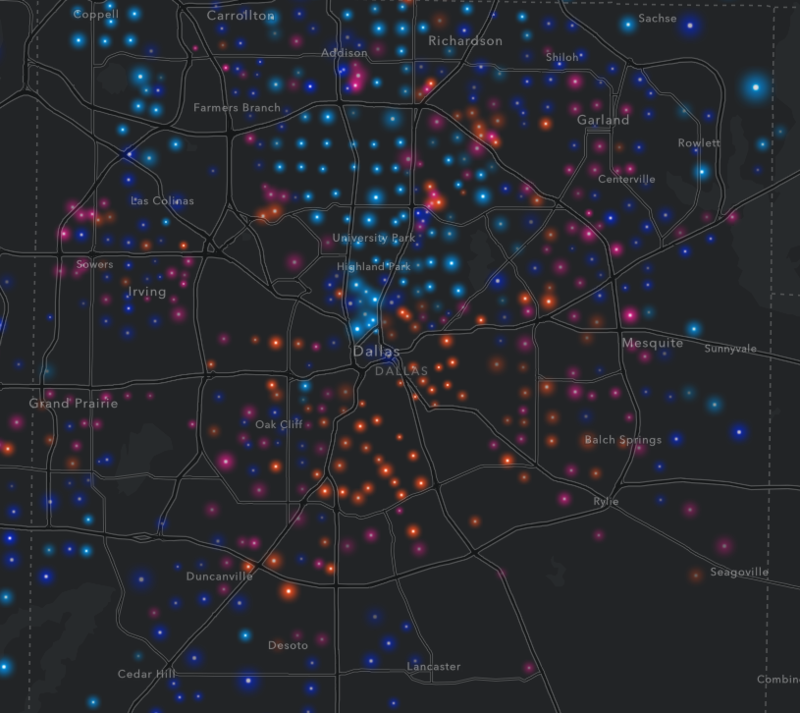 The mapping tool’s last layer looks at income diversity, measuring how many homes in a particular area fall in different income brackets. Pink is less diverse, while light green signals a healthier mix of incomes. Nothing especially new here, just further visualization of the fact that while the rich get richer and the poor get poorer, they are doing it away from one another. Fair housing advocates here and elsewhere would contend that geographic isolation is, in fact, part of the problem.